Principal Alexis Thomason shares why Storefront Academy is an outlier among other schools. EAST HARLEM — Walking down East 129th Street, near Park Avenue, three unassuming buildings that fit uniformly with the block's historic brownstones house Harlem’s little “secret:” Storefront Academy, an independent elementary school. Principal Alexis Thomason, a Harlem native, has been at the helm of the school for four years. “What I knew about the Storefront, working in charter schools, working in the community at the time, was that it was the only school that was offering something different,” said Thomason, who has a background in educational psychology. The school, which serves pre-K through eighth-grade students, was opened in 1966 by poet and community activist Ned O’Gorman as a community space, where children could do arts and crafts and get a hot meal, said Thomason. In the '80s, the space became an elementary school alternative for neighborhood parents. Storefront expects academic rigor, but also balancing achievement with the needs of individual students, which Thomason said is a part of the school's “secret sauce." Storefront, which is tuition-free and does not do state testing, has life and study skills classes, a mentorship program and counseling, among other services, outside of traditional classroom instruction. 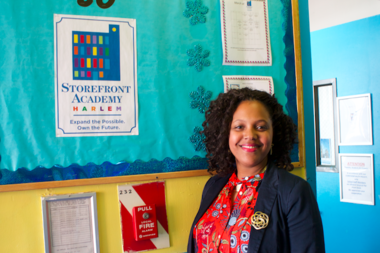 DNAinfo New York sat down with Thomason to talk about her role as principal as well as Storefront Academy's achievements. This interview has been edited and condensed for clarity. Everyone — from myself down to the kitchen staff — has to model what we expect. So one of the things I tell my teachers is you're not a classroom teacher, you're a school teacher. Every child here is your student. So if you see them doing the wrong thing on the playground or if you see them doing the right thing in the hallway, that's your moment to praise or give a consequence. They need to know that everybody's watching. We have this culture that we build relationships with everyone. And so you can have a fifth-grader who loves his fifth-grade teacher, but like has the best relationship with the (math teacher) in eighth grade and goes up to his class every morning before school because they play math games. So all of our adults, in a very organic way, have connections with pockets of students and we know our kids. They stay with us. The other part of the secret sauce is teachers feeling as if they teach with their life and not just their lesson. So our students know our lives, they know what we're going through. They know when we're excited about something. They know when we're bereaving, when we have a death in the family. We talk about those things with them, and they support us. Why would parents send their kids to an independent school versus a public or charter school? One, if want your child to enjoy their education, don't send them to a no-excuses charter school. If you have a child that is a real challenge for you as a parent then, send your child to a no-excuses charter school. So, there's a school for every kid and a kid for every school. We have many kids who came here from Success [Academy Charter School] and were unsuccessful at Success and are doing so much better than they were at Success. We don't get our kids to be in school, on-time every day and doing the right thing through compliance measures. We actually do it by giving them [the opportunity] to make the right decisions...It's finding that balance that works for urban kids. We have really small class sizes. We go from pre-K to eight, with no more than 18 students in a class and two teachers in the classroom. We also talk to each other, so as the kids move up, we talk to the teachers about what works for them and what doesn't work for them. So by the time they get to fourth or fifth grade we know them like the back of our hand. The way that we think about the learning we want to transfer is just very different because we focus on the relationships and we use that to build what we're doing in the classroom because it keeps our kids engaged. What is the “blind admissions” process like? It basically means we are not looking at their academic record or achievement as criteria for entry. We want our classroom to be mixed just like our community. We have inclusion classrooms, students with IEPs [Individualived Education Programs] right alongside students who are gifted and talented. When our students graduate we have students who go to competitive boarding schools...and we have students who go to neighboring public or parochial schools.